UPDATE DECEMBER 2018: Pranburi, the hidden jewel of Hua Hin is now officially part of the government’s initiative to gentrify the area under it’s plan to brand and develop the area as “The Riveria of Thailand“. Hua Hin has long been a desirable destination for both Thais and foreigners seeking a relaxing, quiet beach town within relative proximity to Bangkok. Most people are familiar with Hua Hin as the official residence of the King of Thailand, and he really does live here. I saw him driving in his VW Eurovan with a motorcade of about 50 cars last month, passing less than 3 meters away from us (our big brush with royalty)! Hua Hin was put on the map in 1921 when the then prince constructed the first resort in the area, the Railway Hotel, now, the present day Centara Hotel. It really is beautiful and well worth a visit, especially for the afternoon high tea every weekend. The king Rama VII liked the area so much that he built his summer palace here. Today, Hua Hin is a quieter beach alternative to Phuket or Pattaya. And because of its relative proximity to Bangkok, Hua Hin has quickly become a weekend hotspot for Bangkokians to escape the traffic, enjoy the beautiful, quiet beaches and relax in the unpretentious atmosphere. Perhaps due largely to the royal connection, Hua Hin’s local officials appear to have far less tolerance for overtly illegal businesses or unruly behavior than in other areas of Thailand (read: no Russian thugs or rampant prostitution here, at least not out in the open). Hua Hin and the surrounding areas appeal to a wide range of tourists of all ages, nationalities and economic backgrounds. The sheer number of young families moving here attests to the wholesome nature of the town. Pranburi, a small town even smaller than Hua Hin! When we tell people where we live, we always say Hua Hin, since most people, especially those familiar with Thailand, know of Hua Hin, but this is technically not quite true. One of our favorite areas–where we decided to settle down and build our dream house, actually–is a small town (even smaller than Hua Hin!) about 20 km south of Hua Hin center called Pranburi. Pranburi is comprised of technically 3 sub-towns: Pak Nam Pran and Kao Kalok, both located on the beach, and Pranburi, located inland. These areas, especially Pak Nam Pran and Kao Kalok, cater to a different market than Hua Hin, to those seeking an even quieter, less touristy area than Hua Hin. Many boutique resorts are located in the Pak Nam Pran area, and the style is dominated by artistic, chic, quirky and modern resorts and condominium and housing projects. Pranburi, and Pak Nam Pran specifically, is focusing heavily on the eco-conscious and green-thinking consumers, something Thailand is slowly picking up on, though there’s still a long way to go until the country can boast its earth friendly policies (just take a look at the thousands of plastic bags lining the roads and beaches). Many resorts and restaurants along the Pak Nam Pran strip now advertise organic produce and communal gardens, locally sourced and hand made art. These trends tend to appeal to a younger generation and a more educated, affluent crowd, and this can easily be witnessed by the growing number of tourists along the beach front area, both Thai and Western. With the abundant outdoor activities and the national park in close proximity, the area attracts active people who enjoy the outdoors, and large cycling companies tend to favor Pak Nam Pran, Kao Kalok and Dolphin Bay for their bicycle tours thanks to the natural beauty and safer cycling conditions in the area. Kite surfing is another hugely popular activity along the coast from Hua Hin to Dolphin Bay (just south of Pranburi), and Pak Nam Pran has a few charming spots that cater specifically to the kite surfing crowd, offering services like assembling and disassembling equipment, offering lessons, and serving alcohol, which is rumored to improve kite surfing skills. There are also a myriad of tiny shacks and holes-in-the-wall with no web presence whatsoever, and we love these places, too. Since we can’t advertise for them, we’ll just promise to take our friends and family there when they come to visit. Government officials have been investing in rebuilding the beach front, and massive projects are under way to reclaim the beaches in Pranburi. Furthermore, there are heavy building restrictions on direct beach front land, something that Hua Hin’s officials never monitored closely, and now Hua Hin’s beach is practically invisible from the road, as so much condominium development has occurred directly on the beach in the past 5 years. Slightly further south of Pak Nam Pran is the area of Kao Kalok, designated by a mountain at the end of the road and continuing for another few kilometers along the coastline and stretching inland for approximately 1-2 km. Kao Kalok is even quieter than Pak Nam Pran and significantly more rural. There is much less developed area, and the land prices are still more affordable than in the Pak Nam Pran area. Currently, there are only a couple high quality villa developments in the area, and we are fortunate enough to live in one of the best developments with the best quality homes in all of Hua Hin and the surrounding areas. The reputation of this development is far reaching, and the homes have attracted many people to the area who are looking for all the qualities mentioned above that Hua Hin and the other beach areas in Thailand are not able to provide. 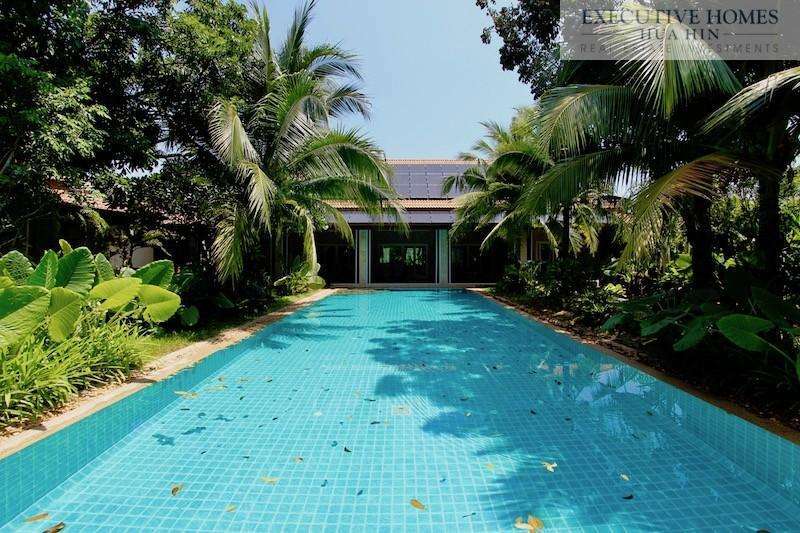 Pranburi is still relatively much more affordable than the surrounding areas of Hua Hin and Cha Am, both for home prices and for general cost of living. These developments offer villas in the price range of 6 M THB at the low end to upwards of 35 M THB at the high end, so there’s something to offer virtually every price range. And now, there is another huge development planned for the Kao Kalok area, and if it is fully realized, it will put Kao Kalok on the map as a major destination point. The developers are a large Chinese and Thai partnership with many high end projects under their belt. The plan is to construct a massive golf course with residential homes, condominiums and a resort surrounding the course. They also intend to have a shopping center, a high end spa, and a Chinese medicine clinic within the scope of the project. This will significantly alter the landscape and the atmosphere of the area, not to mention skyrocket the property values for both developed and undeveloped land. Our feelings are mixed on the slated project. On the one hand, for people who already own a home in the area (like us), this is great news for projected increases in property values. On the other hand, for people who were initially attracted to the area for its natural beauty and quiet and peaceful atmosphere (like us), this development will change Kao Kalok. Change is inevitable, so we’ll just hope for the best and enjoy the pristine landscape while we can. And then, hopefully, we can enjoy the manicured slopes of a rolling green golf course and a great acupuncture session in a couple years’ time.